When I married, the entire bill for my wedding came to right around $3,000. This was more than 12 years ago, and my husband and I aren’t very spendy on things like that. We have a good relationship, so why do we need to hamper it with debt for a wedding? Even if we paid for a lavish wedding out of pocket, both of us would be thinking about what we could have spent the money on instead. Even with our relatively inexpensive wedding, we wish we had done something different. Our parents covered the costs of our wedding, but my mom offered me a deal: We’ll give you the money if you elope. There are times, looking back, that we wish he had taken the money and run. But we aren’t everyone. For some couples, a big wedding is important. They want that day. And that’s fine. If that’s how you want to spend your money, I’m not going to judge you. Some of my financial choices — choices that I’m happy with — would probably make you cringe and call me five kinds of stupid. If a big wedding is important to you (and the average cost is up to $30,000 right now), it becomes a Big Deal. And something you need to protect. 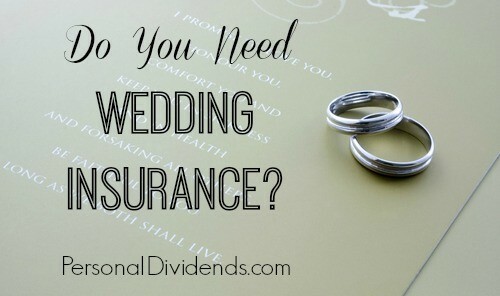 As a result, it’s no wonder that wedding insurance is becoming increasingly popular. Liability insurance that says you’ll pay for injuries at a venue. Some facilities require you to have wedding insurance so that they don’t have to bear the cost if guests are hurt at your wedding. Cancellation insurance. What if you don’t go through with it? You might already have spent money on venues (non-refundable deposit) or on catering, or flowers, or any number of things. I know someone who had already spent thousands on non-refundable wedding preparations — only to have his fiancee end the relationship a month before the event. He didn’t have insurance, and is out the money. You can also get coverage for postponement. Going out of business. Another concern is the companies you use. What if they fold before the big day — and you’ve already paid a deposit? You might not get that back. The right wedding insurance policy can help you recover your spending. Travel. If you have a destination wedding, it can make sense to get additional travel insurance. Or, you can ask your insurance broker whether or not there is a way to get your travel insured through the wedding policy, just to keep things simple. Don’t forget that some wedding insurance plans come with deductibles, so you need to make sure that you are aware of that. If you have a deductible of $1,500, that means that you will still have out of pocket costs, in addition to the cost of the policy. However, paying those costs is probably better than losing $20,000 — or more — if your wedding plans fall through. What do you think? How much did you spend on your wedding? Would you consider wedding insurance for your nuptials?